What started out as a website design project, turned into a full-blown brand overhaul. 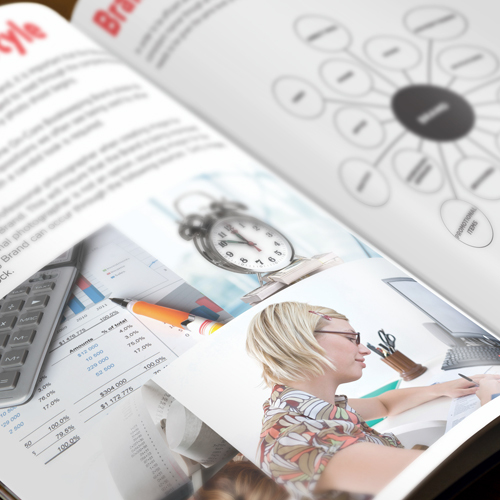 Lynn approached Wake Creative to redesign their website. 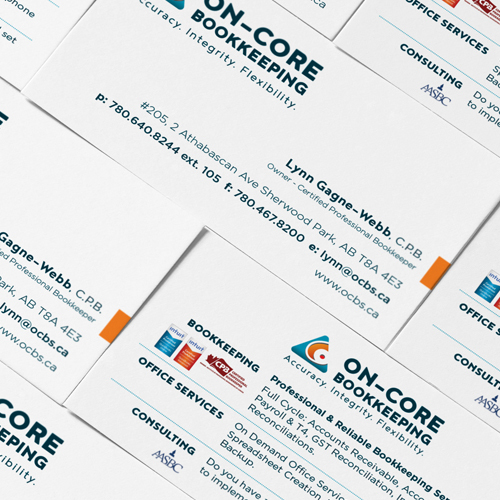 After asking Lynn about her target audience and future goals for On-Core, we knew that this project needed to start at the foundation – her brand. Her existing identity was clumsy and dated. There was no readability or anything impactful about the look that would attract her target audience. We explained to her that redesigning the website was only a temporary solution to an underlying problem. Her company was not communicating effectively to her target audience. Her perception to prospects was sending the wrong message. She agreed in protest that she needed to change her look and communicate why On-Core exists. It was a tough uphill climb working with Lynn. There was an emotional attachment to her existing image because she created it for herself. Patience and understanding was needed to make sure the branding transformation would go smoothly. When we begin any major brand development project we start at the beginning – why a company exists. The process starts with a number of meetings with the owner of the company to discover their purpose. Once we have their purpose discovered, we then begin on other elements of their brand. 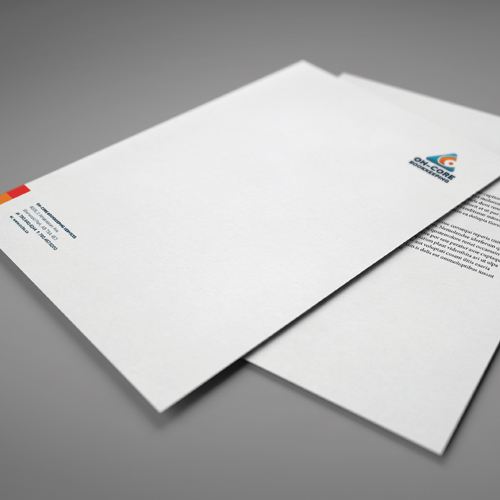 The whole story that unfolds allows us to develop a logo design and supporting materials. These materials effectively communicate the brand and tell the story of why a company exists. Lynn was resistant to the process at first but the line of question we asked, made her think about her company on a deeper level. So much so that she asked herself what she truly wanted to achieve with her company. Once we crafted her Purpose statement – Everything we do is to instill confidence in others so that they can create success and security – her business operations made sense. Every piece of her company started to come together. We created a logo that represented the brand in a way that was not too cliché or too abstract. As we looked around at her competitors and the industry, we saw that they played with the typical symbols to represent their business – abacus, scales, books, checkmarks, and swooshes. 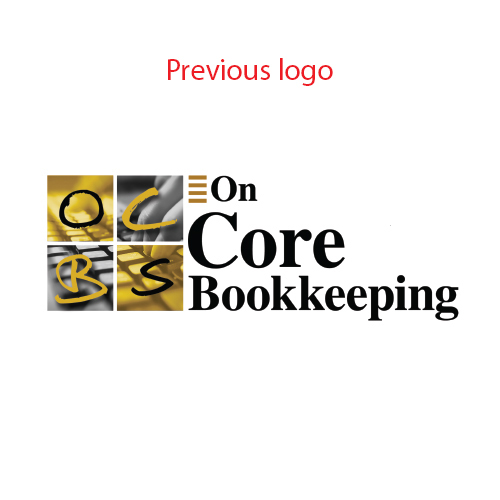 Because her bookkeeping business was unique and her level of service is second-to-none, we had to create a logo that exemplified her company. When building structures, the triangle is strong and reliable. Each side evenly distributes the weight. The 3 sides are representative of her slogan – Accuracy, Integrity and flexibility. The triangle represents dependability and instills confidence in her clients that they made the right decision. 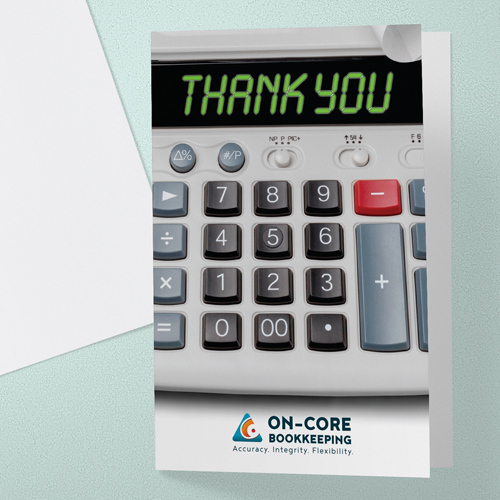 The side silhouette of the counting machine ticker tape abstractly forms an O and C for On-Core Bookkeeping. 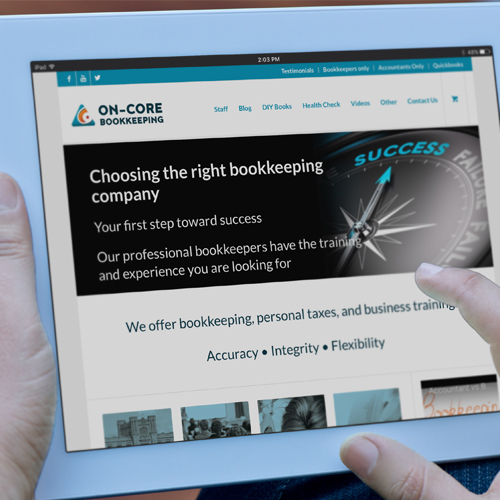 On-Core uses colour profiling so she can match clients with the right staff member. We thought this was a really cool client experience that needed to be represented in the logo. Orange was used to represent the staff of her office, blue for their honesty and professionalism. Red representing their client’s colour profile. 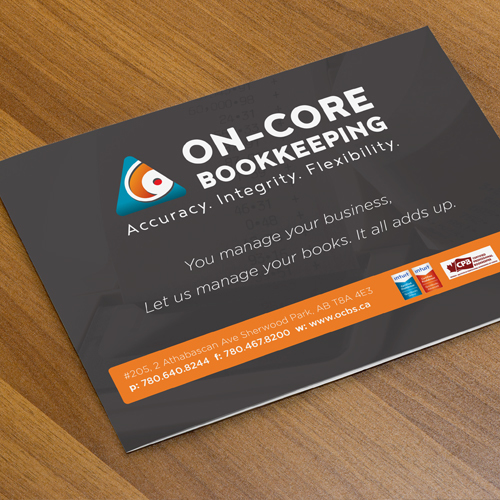 Getting to know the history of On-Core, why it exists and the services it provides, helped us in creating the brand. From its Vision, Mission & Values to the persona, omni-sensory touch points, imagery and more – we created a cohesive story that allows any employee to understand why they work at On-Core. It has allowed them to effectively communicate their brand to future marketing strategies. We compiled everything we developed into their own Brand Bible. This defacto book will help On-Core create cohesive marketing strategies. It onboard’s marketing contractors and employees with great detail so they know why, how and what On-Core does. The Brand Bible also keeps On-Core on track. Never deviating from who they are and why they do it. After Wake Creative completed this portion of the project, it was then handed off to Nyche Marketing for website development and Torch 7 Creative Media for video production. Thank you for having patience. I know that I can be a hard person to sway, but you successfully managed to do it. By the way…I now love my logo and it looks pretty damn good on my wall.